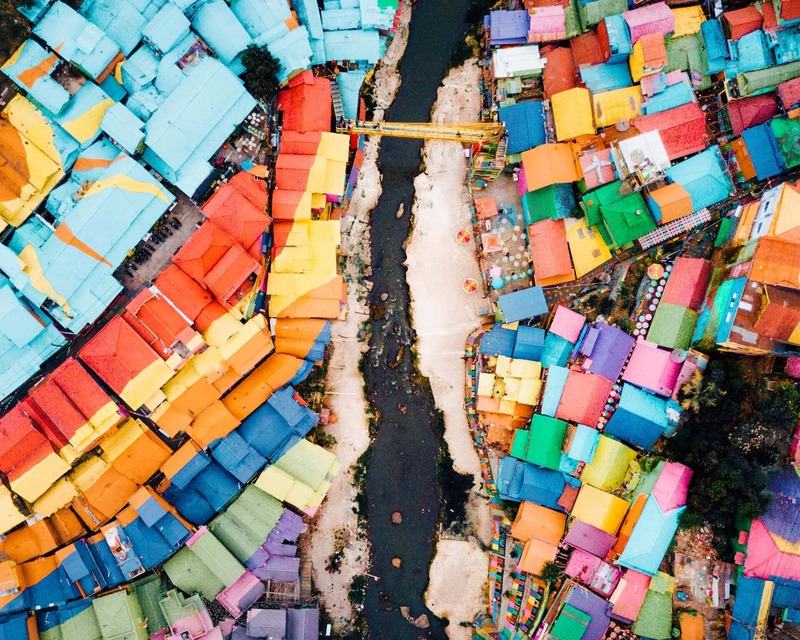 Somewhere in East-Java is the most colorful village you have ever seen! 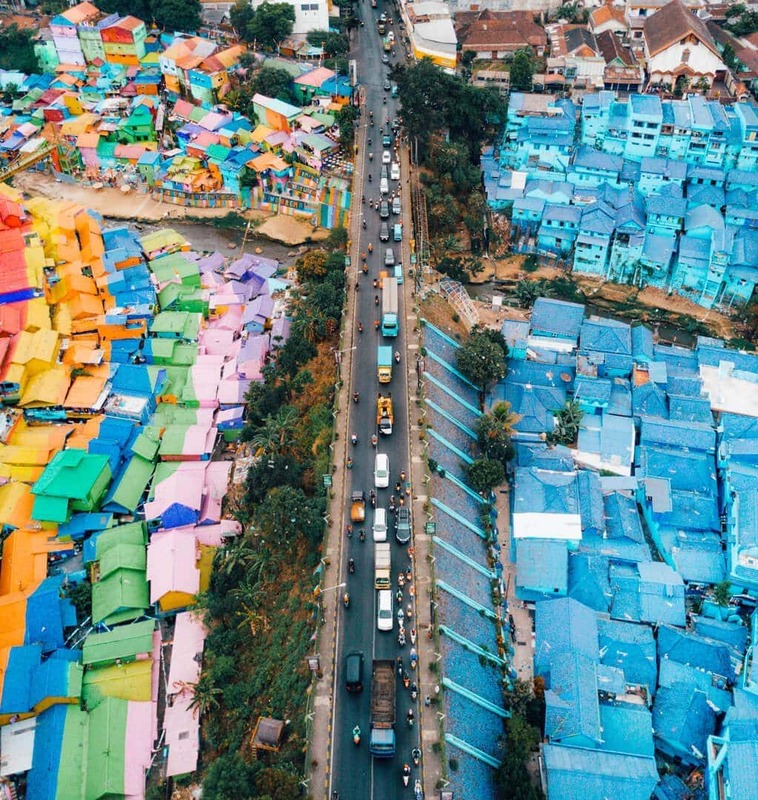 A few years ago, an entire slum area in the city of Malang, Indonesia was basically given up. The living conditions of this village were that bad that the government wanted to relocate all residents. 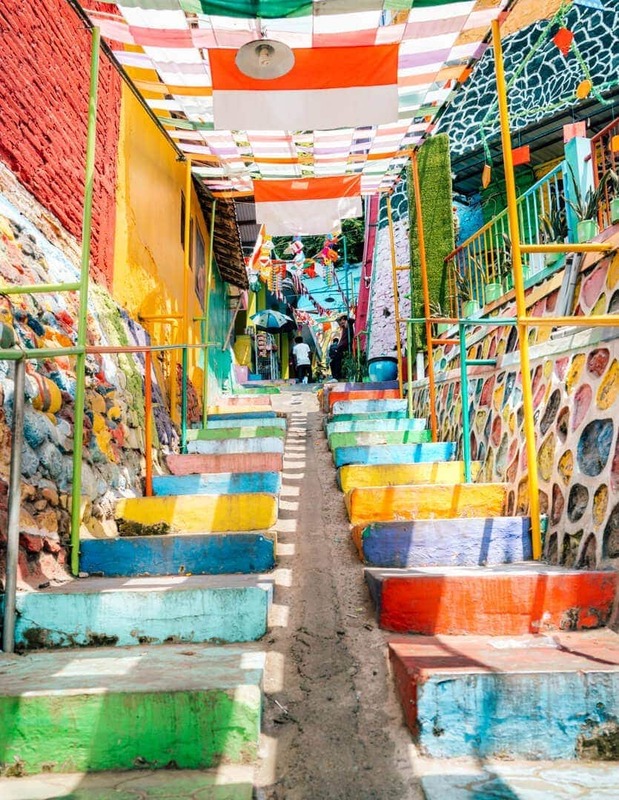 A group of students from a university in Malang came up with the idea to give the whole area a fresh and remarkable splash of paint in the hope to attract the attention of tourists. 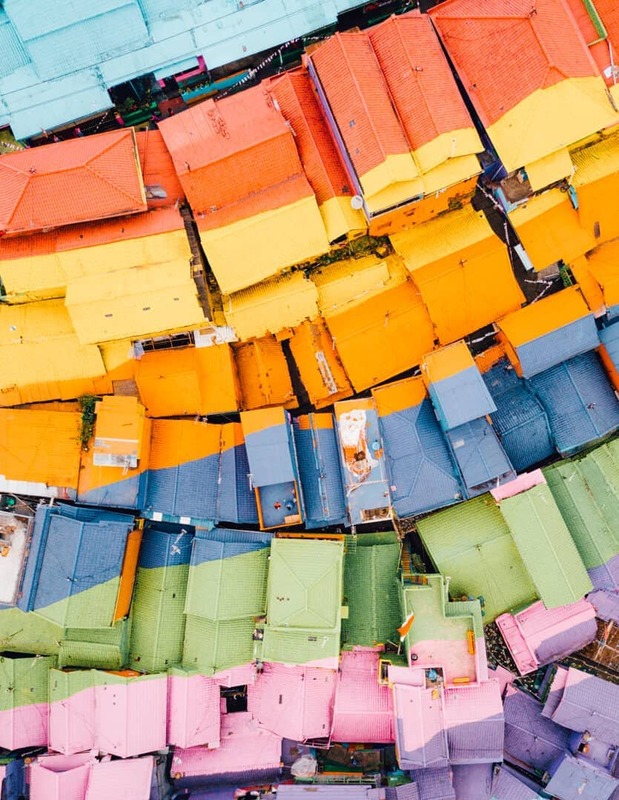 In June 2016, the air force troops painted the entire village (named Jodipan) and directly after, tourists started to notice this colorful rainbow village in Java. Malang is the stop before they are visiting Bromo. 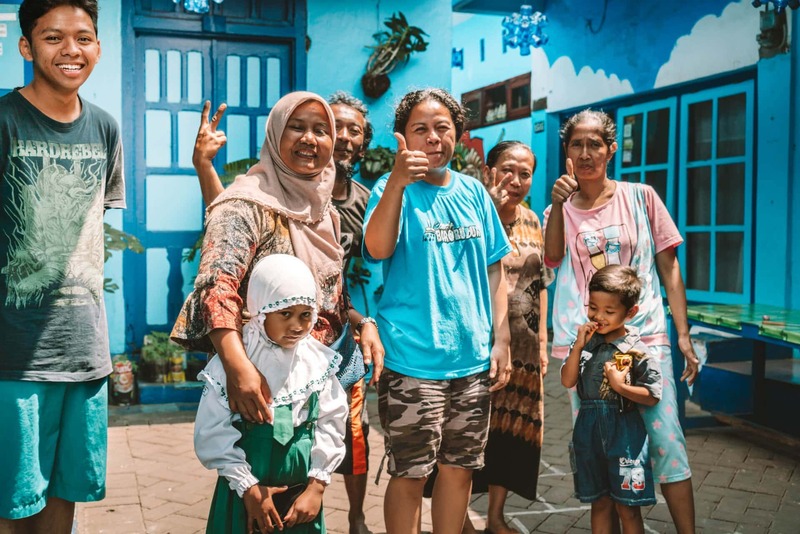 Most tourists come to Malang, Indonesia via train because of its great connection. 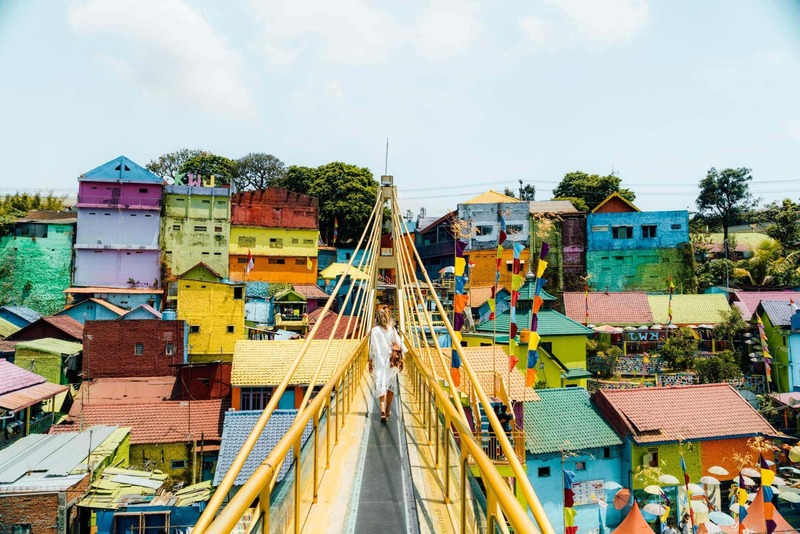 Right before you enter the final stop in Malang, you will drive over a bridge which is directly next to the rainbow village Jodipan. And that is the reason how tourists found out about this village and became popular so quickly. An absolute must-see during your 8-day Java Route. 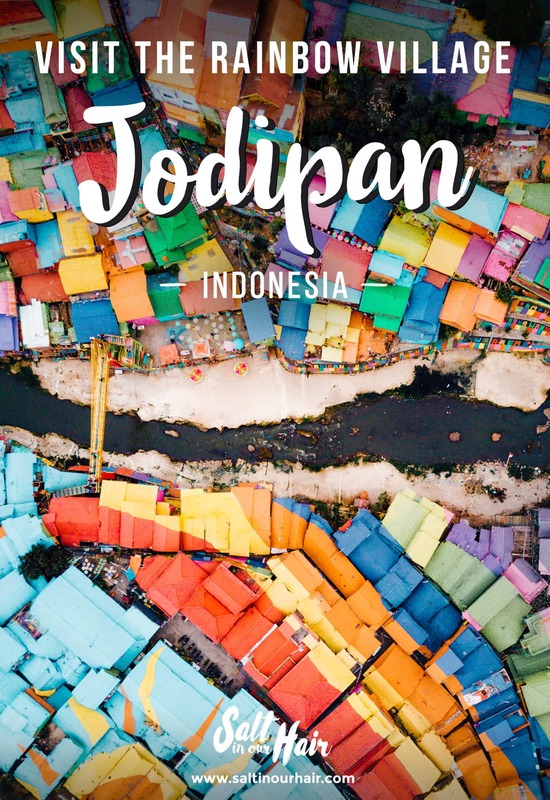 Every single house in Jodipan has a different color. 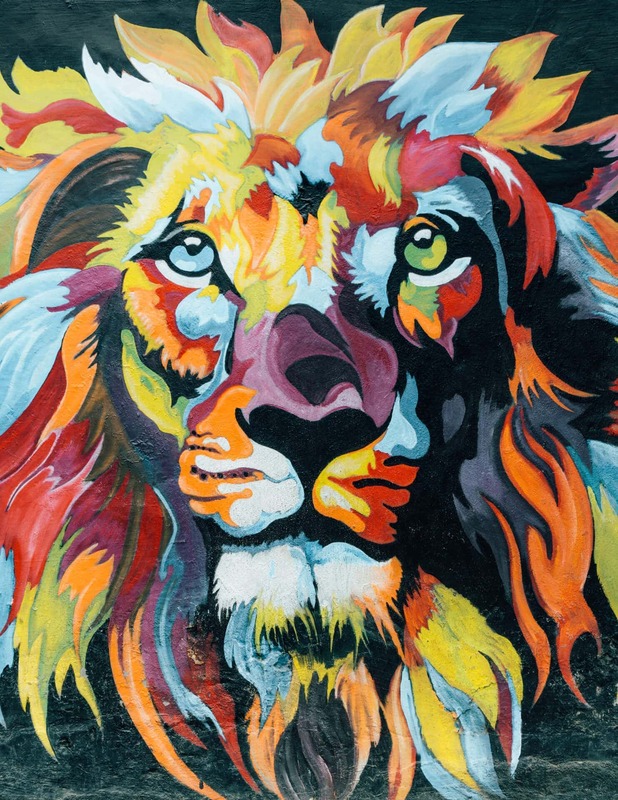 After each new corner is a mural which can change from a simple minion to a full 3D tiger. There is a great arty vibe going on with many decorations like colorful umbrellas. There is a bridge over the river that connects one rainbow part to the other. Entering the village can be done from a few different sides and there is a small entrance fee of 3000 IDR (~ 0.35 USD) for the locals. Most of them can make a living from selling food and drinks to the tourists. Now when we talk about tourist, we mainly mean Indonesian people who want to see this area with their own eyes. Plan to spend about 30 minutes to 1 hour in Jodipan. On the opposite side of the train track bridge, is the blue village in Malang named Kampung Biru Arema. This entire new project was painted blue in April 2018. 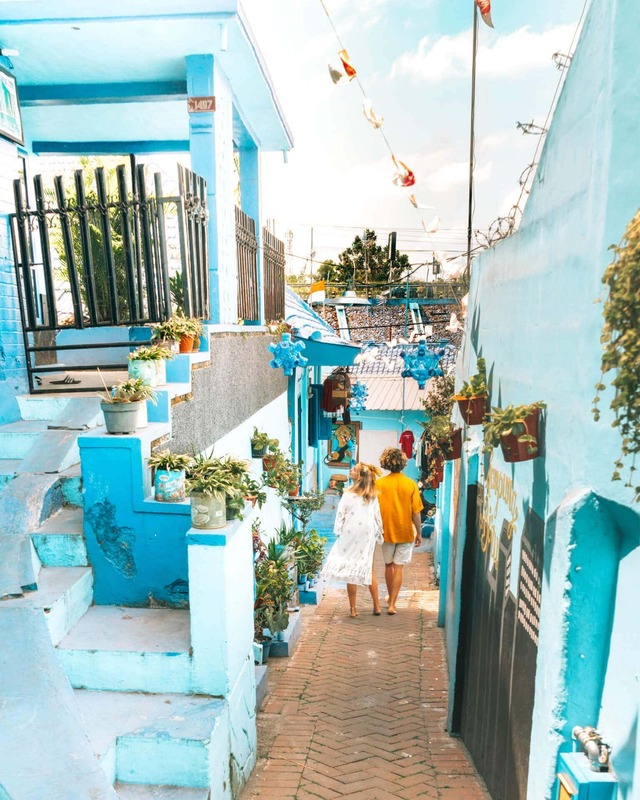 If you are familiar with the blue city Chefchaouen in Morocco, this is the smaller version of it. During our visit in September 2018, this village was completely unknown to tourists. 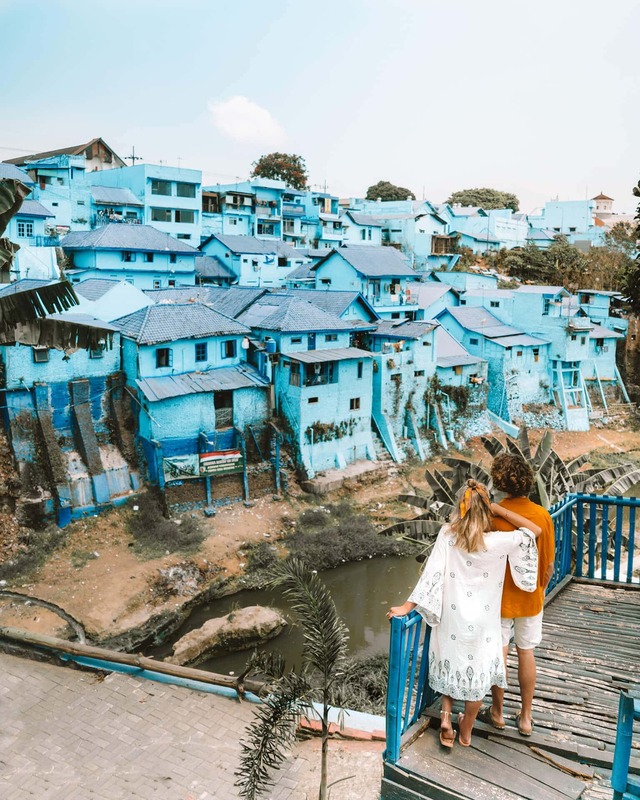 We accidentally stumbled upon the blue village. 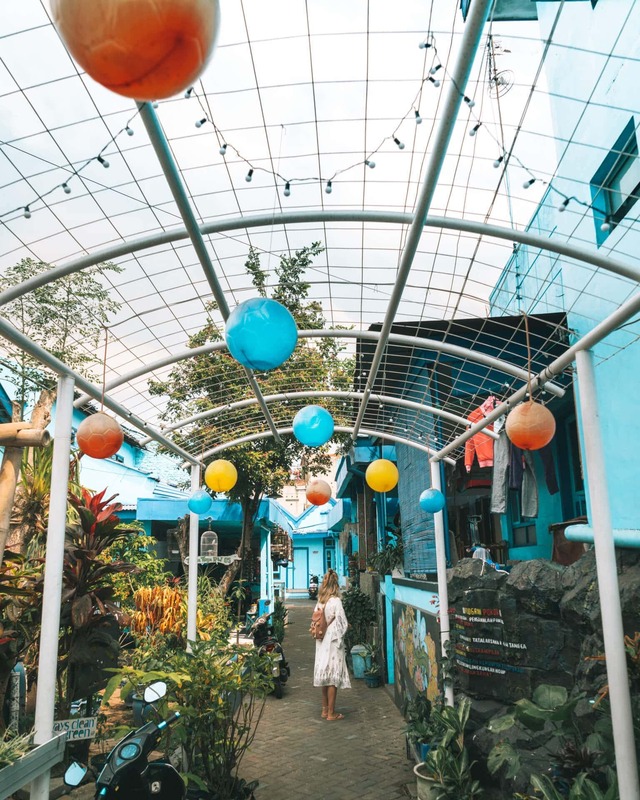 Expect a wonderful time with loads of photos with the locals and chatting with them using Google Translate since you will be one of the first tourists they have seen. 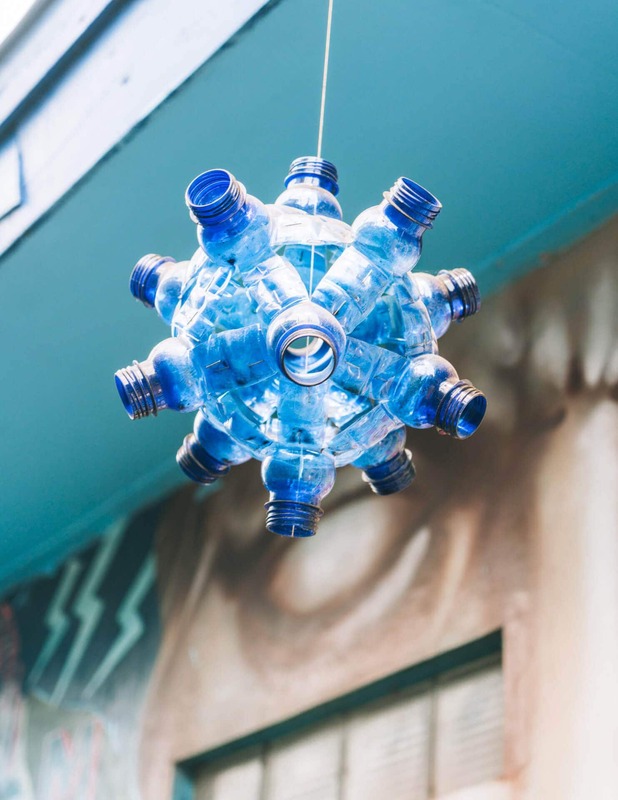 Like Jodipan, the area is full of small recycled artwork and beautiful murals. Near the train track bridge is a small viewpoint called the treehouse. It wasn’t finished during our visit but it will be now. Expect to spend about 1 hour in the blue village. We couldn’t find an entrance fee so just buy something from the locals if you would like to help them. After wandering around for a little while you don’t have the feeling that you are in Java, Indonesia. 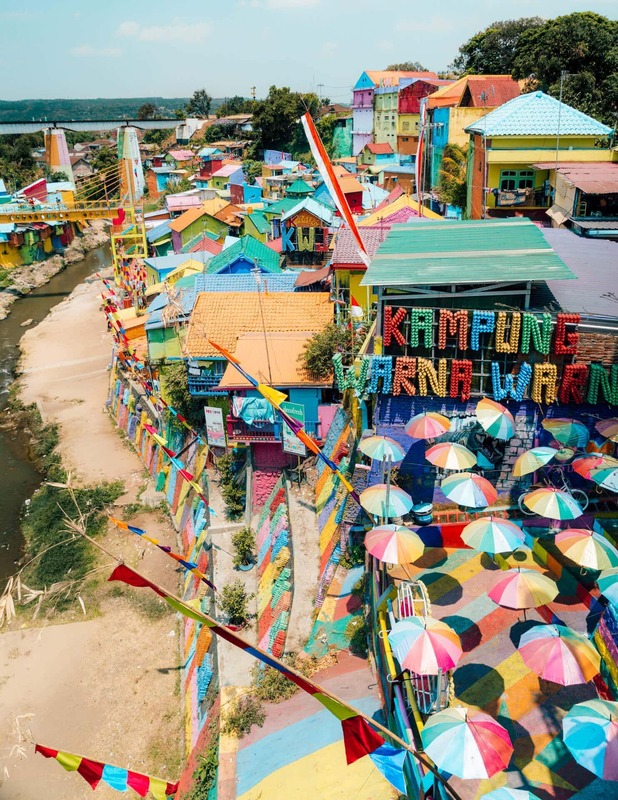 These villages are an absolute must-visit in Malang. Great staff, perfect location for a good price. For more luxury, plan a stay at this bestseller!